Neural network is no longer an uncommon phrase to the Computer Science society or lets say to the society in general. The main reason that makes it so cool is not just the amount of real-world problems it is solving, but also the kind of problems it is solving. How can they be so varied? Be it in the field of Cognitive Psychology, be it in the domain of Cyber Security, be it in the area of Health-care (You are not considering Computer Vision, Computer Graphics, Natural Language Processing, etc. for the time being.). Let's name the more uncommon ones! Almost each and every industry is getting tremendously benefited by the intelligence and automation a neural network has to offer. But why? This is the question that keeps coming and coming! Well, the answer for this is still under active research because Neural Networks are quite a black box in nature and its resemblance with a brain makes this question more complicated. Anyway, answering that question is not the objective of this post. One thing is for sure! To get expected results from a neural network the one thing that has to be ensured is its Training. And by now, you already might have discovered Training very large calls for a tremendous amount of computation power. Without good GPUs, SSDs it is almost impossible to train a very large neural network. Now how much is very large? Well, large enough to produce good results on an ImageNet dataset because that is kind of a benchmark. But this very idea of training vast neural networks got revolutionized entirely when a team of talented researchers from Fast.ai was able to beat Google's model achieving an accuracy of 93% in just 18 minutes that too was only $40. But what were the key ingredients behind this to occur? State-of-the-art GPUs? State-of-the-art TPUS? State-of-the-art SSDs? Absolutely not. The team's configuration was quite simple as the cost is only $40. The key ingredient was the use of state-of-the-art algorithms to train the neural network. In this blog, the great researcher and educator Jeremy Howard has discussed the main reasons for this big win. This is a classic example where the power of costly hardware gets lost to the power of powerful algorithms. In this post, you are going to uncover the details of one such technique that can ensure a neural network is trained with the best possible learning rate. This technique is known as Cyclical Learning Rate (CLR). This was proposed way back in 2015 by Leslie N. Smith. You can check the original paper here. But why are you going to cover only learning rate when there are other essential hyperparameters like dropout rate and activation functions? It is because the learning rate is the most important one among them. Just that! Quickly revisit why learning rates are needed? What are the techniques available for finding the most suitable learning rate for a neural network? Why are learning rates needed? Let's quickly revisit the primary purpose of using learning rates for training a neural net. The term in the rectangle is the update rule with which the network starts to learn its parameter $\theta$1 where $\alpha$ is the learning rate. In the first curve, the lowermost point is the minima of the loss function. Suppose, in the current iteration, your network is in near the left topmost point. Now, in order to converge the lowest point, you take partial derivatives of the loss function $J(\theta1)$ and compute the gradients for getting the directions towards arriving at that lowest point. To arrive a bit faster at that point, you add another term $\alpha$ which is the learning rate. The lower the value, the slower you travel along the downward slope. While this might be a good idea (using a low learning rate) in terms of making sure that you do not miss any local minima, it could also mean that you’ll be taking a long time to converge — especially if you get stuck on a plateau region. That was a quick recap of the objectives of learning rates in simple words. Now you will study the techniques of choosing a good learning rate for your neural network. There is no fixed learning rate for a neural network. It depends on the kind of problem you are working on, the type of data you are feeding to your network, and most importantly the structure of the network which varies from problem to problem. Handpicking a learning rate is a very painful task because in the case you are training a large network you can incur massive amounts of costs. And it is very time-consuming as well. Should you run standard hyperparameter optimization methods like Grid Search or Random Search? That is again horrible for a large network. But why do you keep coming to large networks? It's because almost any real-world complex problem will need an extensive neural network. Before CLR, Adaptive Learning Rates were proposed which can be thought as a competitor to CLR but experimentations with Adaptive Learning Rates are computationally expensive which CLR is not. Still now, the most common practice is to set the learning rate to a constant value and decrease it by order of magnitude once the accuracy has plateaued. Therefore, there is a clear need for a systematic technique which can simplify the process of choosing a good learning rate for a particular neural network. Not only this but also, there has to be a sufficient amount of reasons which would support that approach as to why it is trust-worthy. It seems Cyclical Learning Rates (CLR) appeared just in time. CLR gives an approach for setting the global learning rates for training neural networks that eliminate the need to perform tons of experiments to find the best values with no additional computation. CLR provides an excellent learning rate range (LR range) for an experiment by introducing the concept of LR Range Test. You will study this section merely for building your intuition of how CLR works. In the next section, you will dive into more details. In the previous sections, you briefly understood why learning rates are used in any way. Let's again recall it. An ideal learning rate would be the one which performs a steep decrease in the network's loss. Here comes the wizardry of CLR. The original CLR paper talks about an experiment wherein you can observe the behavior of learning rate with respect to the loss. The experiment is straightforward to visualize where you gradually increase the learning rate after each mini-batch, recording the loss at each increment. This gradual increase can be either be linear or be exponential. And yes, this is essentially the LR Range Test. After performing the experiment Leslie showed us, for too low learning rates, the loss may decrease but at a very shallow rate. When entering the optimal learning rate zone, you'll observe a quick drop in the loss function. If you further increase the learning rate, then it can cause parameter loss in the network which in turn might lead to the increase in losses. So, from this experiment, it is clear that you are interested in a steep decrease of the loss function and for that, you can analyze the gradients of the loss function at different stages of the training. So, from the above graph, you can easily spot three different phases where the loss does not change much, then comes a time when a steep decrease happen and then again the loss starts to increase again slowly. Can you see the steepest decrease among all the other reductions? Yes, essentially you want to end up in that range, and CLR will give you a disciplined approach in finding it. Getting the hang of it, let's find out more. Source: The original CLR paper mentioned at the beginning of the tutorial. triangular2 - It is as same as the triangular policy except the learning rate difference is made half at the end of each cycle. This means the learning rate difference drops after each cycle. 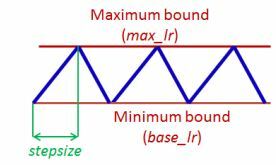 exp range - In this case, the learning rate varies between the minimum and maximum boundaries and each boundary value declines by an exponential factor. One question you might have quickly asked yourself at this point of time is - How can one estimate reasonable minimum and maximum boundary values? Remember the LR Range Test that you studied just a moment ago? Now, you should be able to find its relevance better. Run the model for several epochs while letting the learning rate increase linearly (use triangular learning rate policy) between low and high learning rate values. Next, plot the accuracy versus learning rate curve. Note the learning rate value when the accuracy starts to increase and when the accuracy slows, becomes ragged, or starts to fall. These two learning rates are good choices for defining the range of the learning rates. Let's do a quick case study now to see how CLR can give amazing results. You will be doing this using the classic MNIST dataset which is probably the most popular dataset for getting started into Computer Vision and Deep Learning. Check out this blog if you want to learn about MNIST in a very detailed manner. You will use keras extensively for all purposes of the experiment. keras provides a built-in version of the dataset. You will start off your experiment by importing that and by performing some basic EDA. You have imported the dataset successfully. Now, you will do some basic visualizations of the dataset. That's great! You will straight proceed towards building a simple multi-layer neural network. But before that, you will do some basic data preprocessing. The images in the dataset are of 28*28 dimensions which is difficult to accommodate in a simple multilayer neural network. That is why you converted the images into a single dimension where each image contains 784-pixel data using the reshape() function. The pixel values in the images are in the range of 0 - 255. A good idea will be to decrease this even further by normalizing the range to 0 - 1. The output variable is an integer from 0 to 9. This is a multi-class classification problem. You will perform one-hot encoding of the class labels for getting a vector of class integers into a binary matrix. You will do this to do a “binarization” of the category and so that you can include it as a feature to train the neural network. You can easily do this using the built-in np_utils.to_categorical() helper function in keras. Let's see what all you did in the above code. You are sequentially constructing the network (which is a linear stack of layers). Then you started to add the layer in your network wherein the first layer you added the neurons (which is equal to the number of pixels in an image, i.e., 784) and you specified the input dimension of the images which is in this case as same as the number of the pixels. You instructed your network to get itself initialized with weights from a normal distribution. Finally, you supplied relu as the activation function for the first layer. In the final layer, you kept the number of the neurons to 10 (which is the number of class labels), and you provided the activation to be softmax to turn the outputs into probability-like values and allow one class of the 10 to be selected as the model’s output prediction. You compiled the model as to decide the optimization method of the model (which is ADAM in this case) and the which kind of loss this method will optimize (which is categorical_loss in this case). Now you will train the model and record the time it took to get trained. You will also test its performance. This simple model did quite well achieving an error rate of just 1.91% in approximately 87 seconds. Now you will see the power of CLR. You will start off by cloning the keras implementation of CLR from Github. After a successful clone, you should have the following files into your local working directory. The CLR policy is implemented as a keras callback here. You will pass on this clr_triangular to the callbacks parameter while fitting the network. You will use a larger batch_size this time. You will record the time as well. Can you spot the advantage? This is something amazing to see! You model took only 44 seconds to get trained and yielded even a better error rate than the previous one. Very good! You have made it to the end. In this tutorial, you studied a very crucial problem of finding a suitable learning rate and how CLR completely changed the way you used to approach this problem. You studied CLR covering a good amount of details and did small experiments to see how CLR can produce some excellent results in less time. Study the above two approaches to get even more insights on this topic. Also, after CLR Leslie published a paper titled A disciplined approach to neural network hyper-parameters: Part 1 -- learning rate, batch size, momentum, and weight decay which revisits CLR and discusses efficient methods for choosing the values of other important hyperparameters of a neural network. Leslie also revisited one of his techniques called Super Convergence in this paper. This paper is a must read for anyone, who thinks, eats and sleeps neural networks. Limited applicability is one of the significant shortcomings of CLR. It has to be made full-proof before one can use it in production levels.